NOTE: Translations are generated automatically. It may be possible that these do not reproduce the correct contents of our webpages! The informations and documents indicated represent a condensed listing of products. As such, the listing does not contain all possible products available. If you are interested in a particular product not listed, please go ahead and submit your inquiry. Accuracy of given informations is not guaranteed and subject to change without notice. All rights reserved. No part of this publication may be reproduced, transmitted, stored in a retrieval system, or translated into any language in any form by any means, mechanical, optical, electronic, recording, or otherwise, without the written permission of our company. We reserves the right to revise this publication and to make changes to any or all parts at any time, without obligation to notify any person or entity of such revision and changes. All other brand or product names, symbols and certification logos mentioned in this publication are trademarks or registered trademarks of their respective owners and are indicated for identification only. 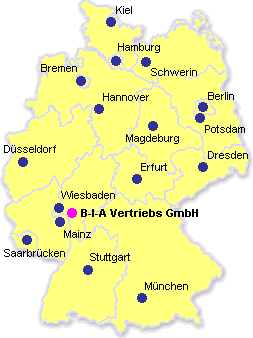 Copyright © B-I-A Vertriebs GmbH, Germany. All rights reserved.